The holiday destination of Sun Valley opened in 1936 as the first purpose-built ski destination in America, modelled after the renowned ski resorts of Europe. It was quickly christened the 'American Shangri-La' and has been a favourite of Hollywood stars and the glamorous ever since. In spite of its elite status, Sun Valley has a laid-back atmosphere. In keeping with the spirit of Idaho, the focus is on the pristine beauty of the environment and the feats accomplished by athletes and outdoorsmen. Sun Valley is built around Bald Mountain, known affectionately as 'Baldy' and considered by many to be the single best ski mountain in the country. The old stomping ground of Olympians Picabo Street and Reggie Crist boasts something like 3,400 vertical feet (1,036m), 14 lifts and 65 runs on 2,054 skiable acres. The widely varying terrain of 'Baldy' and neighbouring Dollar Mountain means skiers of all levels can hit the slopes. The ski and snowboard school offer clinics for all skill sets and ages. A wide range of accommodation is also available, from romantic retreats to spacious family options, including four mountain lodges, the original and elegant Sun Valley Lodge as well as village condominiums and cottages. 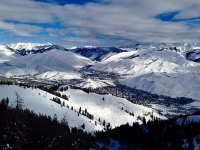 Sun Valley is consistently rated in the top ten by Ski Magazine. Bald Mountain's seven high-speed quads, four triples and five doubles take skiers to a height of 9,150 feet (2,789m), and its terrain includes glades, bowls, bumps, groomers, tree skiing, and easy rollers. It is also famous for its lack of lift lines, allowing for more time on the slopes. Dollar Mountain's gentler, treeless slopes are perfect for beginners, and its tubing hill is popular with families. Snowboarders aren't neglected either, as Bald Mountain is now home to a brand new super pipe. Sun Valley also has one of the most extensive and well-maintained Nordic trail systems in the country. The Wells Fargo Boulder Mountain Tour, one of the country's top cross-country skiing events, is held here each year. Sun Valley is the birthplace of heli-skiing, and the stunning 7,000- to 10,000-foot (2,134m-3,048m) Rocky Mountain range also has well-equipped huts and Mongolian-style yurts for backcountry skiers. Shoppers and holidaymakers will find the latest designer fashions and the top brands in technical skiwear in Sun Valley Village, as well as skiing, snowboarding and mountain biking equipment and accessories. In addition to an art gallery, there are a variety of gift and souvenir shops. Free bus service to lively Ketchum and its shops is also available. Sun Valley's restaurants cater to every taste, from hearty Idaho fare to pizza to gourmet Mediterranean cuisine - holiday visitors won't be disappointed. Those in a nostalgic mood can take the gondola up to Roundhouse, the first day lodge on Bald Mountain, built in 1939. A visit to Trail Creek Cabin is also a tradition, with its sunset views and three outdoor decks open year-round. Visitors can even find sushi in nearby Ketchum. Nightlife comes alive in Sun Valley during the winter months, with holiday visitors enjoying the après-ski socialising. The Duchin Lounge serves special hot-buttered rum that is a must-try. The Boiler Room is a popular nightspot, serving the obligatory American bar fare of nachos and chicken wings. There is no shortage of activities in addition to skiing and snowboarding, including hiking, snow-shoeing, tubing, dog sledding, and ice skating in the winter. Guest can go horseback riding, hiking, biking, rafting, fly-fishing and canoeing inn the spring, summer, and fall. The hot springs of the Sawtooth National Recreation Area are also nearby. Some skiers have found the tighter valleys of the ski areas to be a bit uncomfortable during busier times. Others have judged the trails to be slightly more difficult than their posted ratings. At times, there is a lack of natural snow.